The Brahma chicken is one of the largest chicken breeds, known as the ‘king of chickens’. They are both a meat and egg laying chicken. They also make great backyard pets. 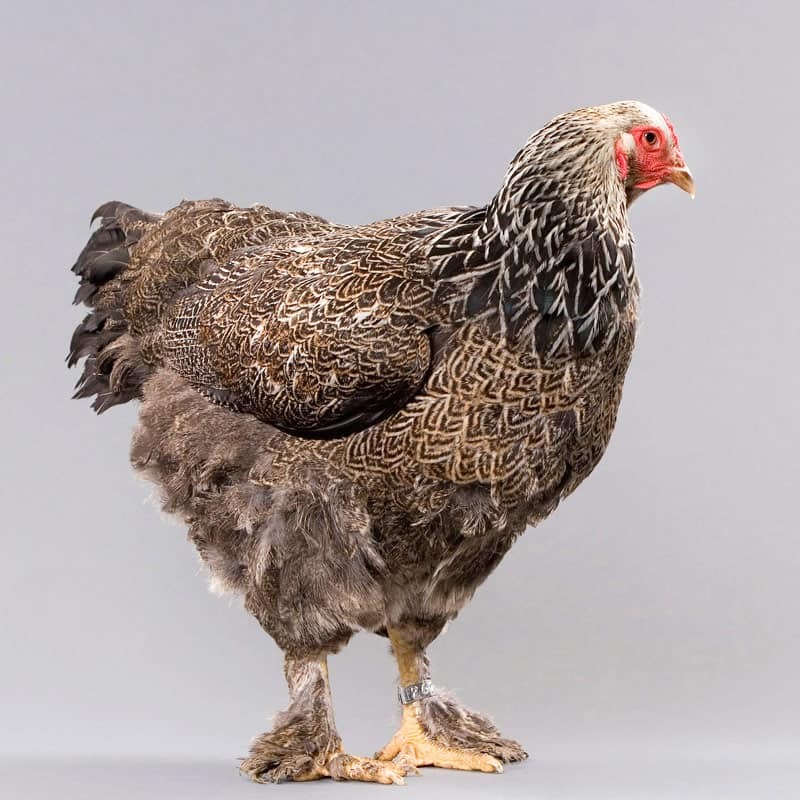 The Brahma was first bred in the 1800’s. In China, a Malay and Cochin were cross bred to create a Shanghai chicken. This chicken was then taken to the USA by sailors. The Shanghai was bred in America with the Grey Chittagong from India. The name ‘Brahma’ is derived from the river Brahmaputra in India. Until the 1930’s, the Brahma was one of the most popular chickens for meat due to its size. However, as industrial farming grew, Brahmas became unfavourable as they can take up to two years to reach maturity. Breeds that matured faster became more profitable for their meat. Brahmas are now steadily growing in popularity again, this time as backyard pets. The Light Brahma is white with a grey undertone. It has some black striping on the hackle and saddle feathers. They were first officially recognised in 1865. The Dark Brahma has notable differences between the male and female. The male has a black body, breast and tail. His hackle and saddle feathers are striped black and white. The female has a grey body, breast, back and wings. She is covered in white and light grey pencilling. The Dark Brahma was also first recognised in 1865. The Buff Brahma has a similar pattern to the Light Brahma, except its colouring is a pale orange-brown. It was first recognised in 1924. Whilst other coloured Brahmas have existed, none have remained popular enough to continue breeding or to be officially acknowledged. There is a small bantam variety of Brahma chickens. They come in five different feather patterns: Light, Dark, Buff, Black and White. Brahma chickens are sold by breeders and companies all over Australia as these friendly giants are becoming more and more in demand as more light is being shed on this amazing breed. Like any Breed of Chicken, making sure you buy off a reputable breeder/seller is essential for a healthy and happy chicken. 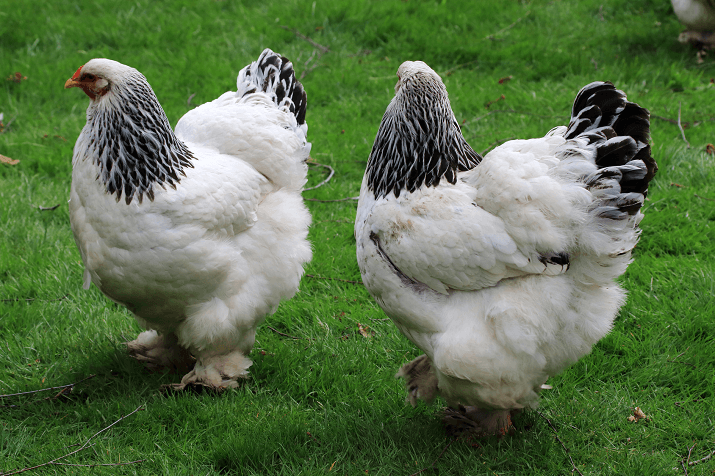 Buying a Brahma chicken are available for sale as an egg or an already hatched chicken and range from around $20 to $50 per Brahma chicken. Brahmas are most recognisable by their large size, with a tall and wide body. They have feathers on their shanks and toes. The Brahma has a pea comb and short but strong beak. Their head is broad with their forehead hanging over the eyes, referred to as a ‘beetle brow’. They have dense plumage with a thick layer of down, making them a suitable breed for colder climates. Brahmas can grow to 75cm tall. They are a notably heavy chicken – modern females can grow to 4kg and males to 5kg. Modern Brahmas are lighter than those in the past. In 1901, females could grow to 6kg and males to 8kg! Modern bantam Brahmas will grow to around 1kg. How Big are Brahma Eggs? Brahma Chickens are considered a very good winter layer of big brown eggs weighing approximately 55g-65g. 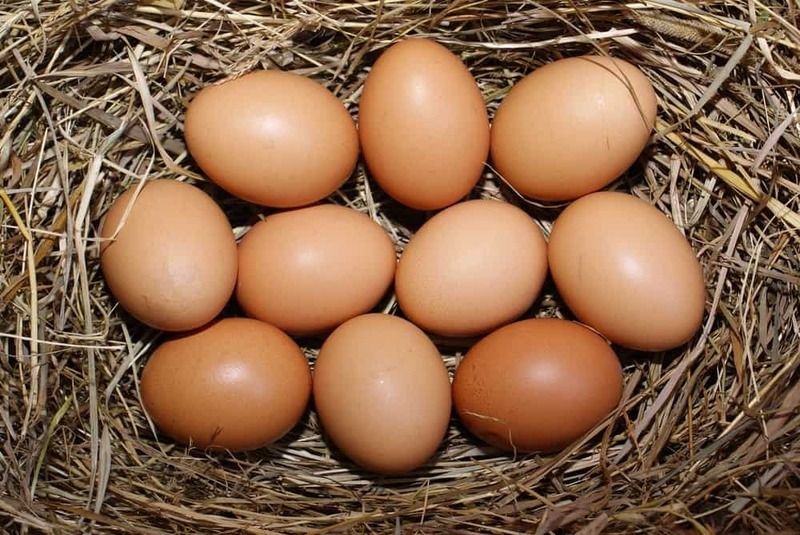 Brahma average 2-3 large eggs each week providing a large sum of roughly 120 brown eggs each year. Brahmas are known for being very friendly and approachable chickens. They are calm and gentle. This makes them very easy to handle. They make great backyard pets including for those with children. Brahmas generally are very healthy and have few health issues. You will need to pay attention to your Brahma’s feet due to the feathers on their legs and toes. If the feathers get dirty with mud or faecal matter and are not cleaned for a long time, the chicken may lose its nails or toes. Wet toe feathers in colder climates also put the chicken at risk of frostbite. For these reasons, Brahmas are better suited to drier areas with well-drained soil. Toe feathers will sometimes break off and bleed. If this happens, apply pressure then a small amount of corn starch to the area. Because their feathering is dense, it can be difficult to spot mites or lice. Regularly check your Brahma for symptoms. Due to their friendly nature and because they are easy to handle, Brahma chickens make great family pets. 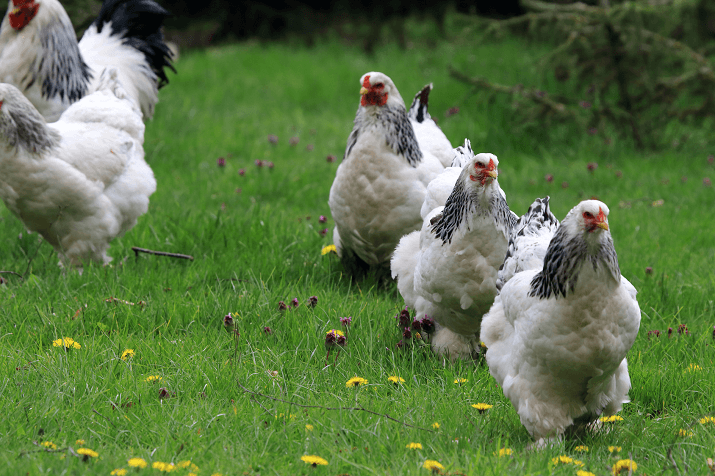 Most Brahmas can be kept with other chicken breeds without any issues. They can be kept behind low 60-90cm fencing as they cannot fly well. They are a quiet breed, with even the males not crowing particularly loud. Brahma hens are great egg layers. Typically, a Brahma hen will lay 3-4 medium sized brown eggs per week. Unlike many other breeds, they happily lay eggs all year round, including in winter! Because they are a large bird, Brahmas will need an appropriately sized coop with larger nesting boxes, taller doorways and strong roosting poles. Due to their size, they generally eat more than other breeds so food bills may be higher. This entry was posted in Chickens and tagged brahma chickens.